Faux wood window shutters by Just Shutters are a perfect way of incorporating luxury and style into areas of your home in a practical way. -Shutters are entirely child safe. Therefore, they are perfect for a family home! -Privacy and security levels of your home will be improved by installing shutters. -Cost efficiency. Shutters will add an additional layer of insulation to your windows. As a result, your home is warmer with lower utility bills. Furthermore, the practicality of faux wood outweighs that of hard wood in certain circumstances. 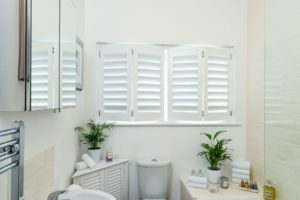 For example, the build up of condensation and moisture in a bathroom runs the risk of damaging some real wood shutters. Our PermaWood range is coated with a water resistant resin and is therefore a great option for bathrooms. In addition, the same principle can be applied to kitchens were steam and condensation may occur. Moreover, faux wood shutters are simply as stunning as any other material! Our CraftWood range is our most popular choice, and it is not hard to see why. Built from a durable MDF and available in a range of finishes, CraftWood delights every time! Whether you are buying hard wood or faux wood window shutters, you will experience the highest levels of customer service from Just Shutters. We have always strived to ensure that each customer who comes into contact with us is entirely satisfied with the product and service they receive. Therefore, we are exceptionally proud of the 9.9/10 rating we have been awarded on Checkatrade! This high rating comes as a result of over 1800 independent reviews. These customers were delighted… we would love you to join them! Contact us on 0845 894 0700 or alternatively click here to find your local shutter expert.